NEWS: (2.19.07)-- "You're creative, brilliant, stylish and mobile. Now you can get a computer to match. Apple-- at Best Buy." How's that for a sales push? 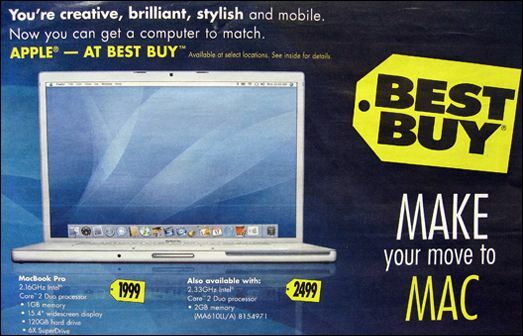 Better yet, "Make Your Move to Mac" in big bold words, as featured on Best Buy's special ad insert in the San Francisco metropolitan area newspapers yesterday. On Sunday, a special 4-page insert was included in the newspaper separate from their regular ad for the week, just two-and-a-half weeks after Windows Vista was the big push in their pages. (What happened to the "Wow"?). And the wording used in their special insert is as creative and innovative as Apple Inc. themselves. "Accessorize Smartly"... adorns one page, with the Wireless Pro Keyboard, the Airport Extreme Base Station, and the Wireless Mighty Mouse the first three products on top. At the bottom, ironically, is Microsoft's Office: Mac and Parallels Desktop for Mac. (In case you still haven't heard, Parallels lets you install Windows, be it XP or Vista, in a virtual mode on your Mac). The cover page features Apple's portable line, with the MacBook Pro on top, and the MacBooks below it. $10 off 13" Incase bags is the incentive to buy a laptop this week, a product previously unavailable at Best Buy until they started selling MacBooks. Surprisingly, the iPods aren't featured in this special insert, but do appear in their regular ad.